Su, W., Chen, C., Xu, H., Yang, W., and Dai, H. (2016). "Filtering whitewater with an ultrafiltration membrane: Effects of the interaction between dissolved organics and metal ions on membrane fouling," BioRes. 11(1), 1108-1124. 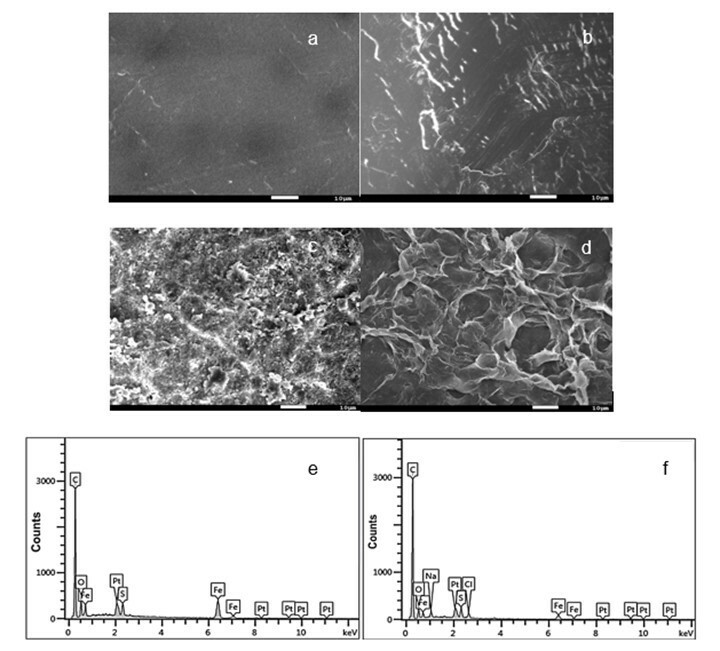 The mechanisms regarding the influence of dissolved organics in papermaking whitewater together with metal ions on the fouling of an ultrafiltration (UF) membrane were studied in this paper. A series of experiments were carried out to characterize the organic matters’ size and membrane flux. The associated fouling mechanism was investigated using the modified Hermia empirical model, resistance distribution, and specific resistance of the cake layer. The results indicated that the addition of metal ions aggravated membrane fouling. Increasing concentrations of metal ions resulted in the higher specific resistance of the cake layer and greater membrane fouling due to their chelation with dissolved organics. Increased pH values influenced the interaction between the metal ions and dissolved organics, resulting in a relatively slow membrane flux decline. Increasing concentrations of Na+ resulted in greater membrane fouling. Cake layer formation played a major role in treating the water samples with high-concentration metal ions, whereas intermediate blocking formation may be the dominant fouling mechanism when treating the solution without metal ions. Increased closure of whitewater systems in the papermaking industry is being carried out progressively to reduce effluent discharge and fresh water consumption (Wu et al. 2014). In other words, process water in a typical paper machine system is being recycled multiple times for various purposes. However, the accumulation of dissolved and colloidal substances (DCS) in this process tends to interfere with the papermaking process (Tenno and Paulapuro 1999; Ashrafi et al. 2015). Meanwhile, the interaction between DCS and added cationic chemicals affects the product quality (Pokhrel and Viraraghavan 2004). Previous studies have shown that dissolved organic matter (DOM) is the main component in white water, and includes carbohydrates, lipophilic extractives, and other chemicals that contribute to their higher solubility and stability (Antony et al. 2012; Su et al. 2015). The removal of DOM from the solution becomes a key problem during the closure of whitewater circuits in the papermaking industry. Membrane filtration has been extensively studied for industrial effluent treatment. After years of development, membrane technology has developed into a promising technology for the removal of DOM in whitewater. Membrane filtering systems have several advantages over traditional disposal methods, including space and energy savings, better safety, and convenient operation (Kumar et al. 2015; Shamsuddin et al. 2015). Nevertheless, membrane fouling is a major obstacle to the successful operation of membrane separation. The permeate flux is hindered because of membrane fouling, resulting in low processing efficiency, high operating costs, and increased cleaning frequency (Guo et al. 2012; Jiang et al. 2012; Karabelas and Sioutopoulos 2015). So far, many studies on membrane fouling have focused on operational conditions (Wang et al. 2008), the characteristics of the membrane (Zhao et al. 2015), and solution properties such as the particle size of organic matters and the ionic strength of the feed water (Chen et al. 2006; Park et al. 2006). A series of studies showed that the surrounding environment, especially metal ions, may be one of the main factors affecting membrane fouling. The solubility and form of the organic molecules can be influenced by metal ions (Kloster et al. 2013). Roger reports that the charge and aggregation of organic matter in solutions may be influenced by the monovalent ion and divalent ions (Roger et al. 2013). Yoon et al. (1998) suggests that inorganic ions can form chelates with organic matters, resulting in the adsorption of organics on the membrane surface. 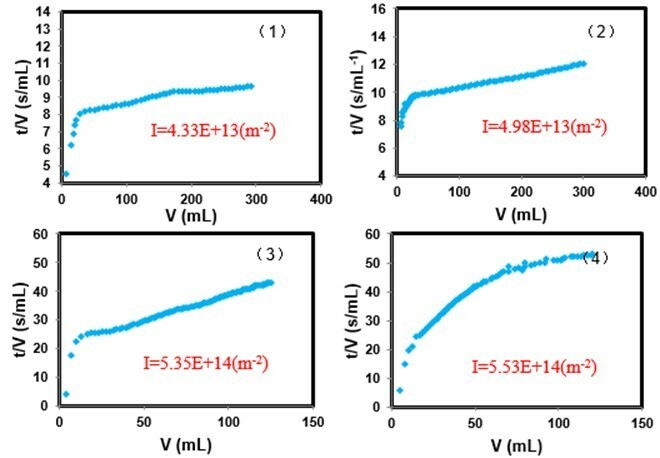 Some studies found that the pH values and metal ions could affect the characteristics of organic substances, retention in the membrane, and membrane permeability (Chon et al. 2013; Feng et al. 2013). However, the mechanism by which different organic matters combined with salt ions affect membrane fouling is still unclear. There is a paucity of available information on the influence of interactions between organic matters and metal ions on membrane fouling under different conditions. Therefore, the characteristics of membrane fouling under typical conditions remain a challenge to membrane technology. To explore the nature of membrane fouling during the ultrafiltration of wastewater, the mechanism of fouling was considered in the light of Hermia’s model. Moreover, the specific resistance of a cake layer was suggested to measure the degree of cake formation on the membrane surface, evaluating the impact of different metal ions’ concentration on membrane fouling (Tang et al. 2014). In this work, the aim was to study the effects of various ions (Na+, Ca2+, and Fe3+) on the membrane fouling behavior of DOM in whitewater. The fouling mechanisms were analyzed using Hermia’s model, the resistance distribution of the membrane, and the specific resistance of the cake layer. This study lays a primary investigation for the formation of membrane fouling filtering whitewater with various metal ions, and gives theoretical support to interactions between various metal ions and DOM in papermaking whitewater. Commercial polyethersulfone (PES) membranes were purchased from Mosu Scientific Equipment Company, Shanghai, China. The PES membrane has a molecular weight cut-off (MWCO) of 10 kDa and an effective surface area of 3.32 10−3m2. The water used was high-quality deionized water (> 15 MΩ cm−1). Low molecular weight (MW) sodium polyacrylate (PAAS) accounts for a great proportion of solubilized polymer content in papermaking whitewater according to a previous study (Chai et al. 2006; Su et al. 2015). Thus, in the present work PAAS (MW 3000 Da) was chosen as a model fouling agent. The stock solution of PAAS (0.25 g/L) was prepared by dissolving the liquid form of PAAS into deionized water. The chemical environment (pH values, ionic strength, high valence metal ion concentration) of feed waters were adjusted with NaOH (0.1 M), HCl (0.1 M), NaCl (10 mM), CaCl2 (3 mM), and FeCl3 (3 mM). The temperature of samples during the fouling indices experiments was maintained at 25 °C. Analytical grade CaCl2 and FeCl3 were used as the metal ion sources. The concentrations of metal ions in PAAS solutions were 5, 10, 15, 20, and 40 mM, respectively. CaCl2 or FeCl3 was first dissolved in deionized water to obtain a given concentration of metal ions. Then, a small volume of these samples was added to the PAAS solutions to obtain the desired concentrations of metal ions. The water sample with a Ca2+ or Fe3+ concentration of 5 mM and an Na+ concentration of 0.1 M was used to study the role of pH on membrane fouling. The pH value was adjusted to 6, 7, and 9 by the addition of 0.1 M HCl. Meanwhile, the water sample with a calcium ion or ferric ion concentration of 5 mM and a pH value of 7 was used to investigate the role of Na+ concentration on membrane fouling. The Na+ concentration was adjusted to 0.01 M, 0.05 M, and 0.1 M by the addition 0.1 M NaCl. All these water samples were stirred for 2 h at 25 °C to obtain a homogeneous solution. A laser particle size analyzer was used to determine the size of PAAS. A 300-mL stirred dead-end ultrafiltration (UF) module was used to evaluate the membranes’ fouling properties (Fig. 1). The experimental apparatus was equipped with a stirrer that operated at a constant rate (250 rpm). The operating pressure was supplied by pure nitrogen at a constant 0.1 MPa. The filtrate was collected in a glass container. The accumulative permeate volume was automatically recorded by a data acquisition system. The membrane flux was calculated from this data. where is the PAAS concentration in the permeate, is the PAAS concentration in the initial feed solution. The concentration of PAAS was determined using a Shimadzu TOC-5000A. where J (L/m2·h) is the permeate flux, J0 (L/m2·h) is the pure water flux, t is the filtration time (min), and k1, k2, k3, and k4 are constants of the model. The main fouling mechanism can be confirmed according to the relevant correlation coefficients (R2) by calculating the experimental data into these formulas. A larger R2 value indicates a better fitting model. where Ji is the pure water flux through a new membrane (L/m2·h); Ja is the pure water flux through the membrane after the static adsorption of organics from the processing water (L/m2·h); Jf is the pure water flux through the membrane, where surface contamination of the membrane adsorbed from the process water was eliminated beforehand (L/m2·h); Jv is the flux achieved at the end of ultrafiltration (L/m2·h); Jl is the raw water flux through the membrane after the static adsorption of organics from the process water (L/m2·h); ΔP is the applied trans-membrane pressure (Pa); and μ is the viscosity of fresh water (Pa·s). The detailed structural information regarding the membranes was examined with scanning electron microscopy, using a filament voltage of 20 keV. Dry membrane samples were dispersed on a graphite ribbon fixed on an aluminum sample holder. The powders were sputter-coated with gold in a modular high-vacuum coating system Q150R ES (Quorum Technologies, Japan). The EDS was used to determine the elemental composition of foulants present on the membrane’s surface. where is the change in streaming potential with pressure, is the viscosity of the electrolyte, k is the conductivity of the electrolyte, and and are the permittivity of the electrolyte and free space, respectively. The particle size of PAAS is an important parameter in membrane fouling since it can affect the membrane fouling type, and thereby influence membrane filtration. 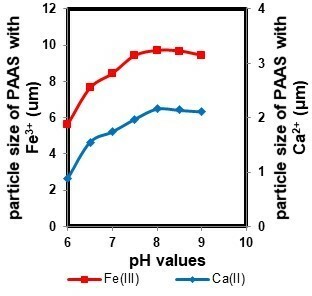 Figure 2 shows the particle size of PAAS with metal ions (Ca2+ or Fe3+) at different pH values. Because of the effects of pH values on the aggregation between PAAS and metal ions, the PAAS size was larger at high pH values than that in the acidic environment. At low pH values, high concentrations of H+ in the solution competed with metal ions for the active sites of PAAS, reducing the complexation between PAAS and metal ions. Therefore, the PAAS size at acidic pH values was small. In contrast, PAAS may offer more binding sites to metal ions to bridge adjacent PAAS molecules in an alkaline solution (Garcia et al. 2014). The complexation between PAAS and metal ions neutralize the negative charge of PAAS, which results in high levels of aggregation, increasing the particle size of PAAS. In addition, differences between the particle size of PAAS-Ca and PAAS-Fe at the same pH values may relate to the complex strength between PAAS and metal ions. This complexation was affected by several factors such as ionic radii, hydrolysis constant, electronegativity, and electron-shell structure of the metal. What’s more, the complexation process may be affected by the density of the ion charge and by the orbital energy valence. (Heidari et al. 2013). The membrane surface properties at different pH values were investigated by zeta potential measurements as presented in Fig. 4. The PES membrane mainly exhibited negative surface charged property over pH ranges from 5 to 9. The PES membrane showed a reduced surface zeta potential within a range from -12.55 mV at pH 5 to -39.28 mV at pH 9. A more negatively charged membrane surface could be obtained at higher pH values. Previous studies suggested that high concentrations of H+ in the solution at acidic pH values could increase the hydrophobicity of the membrane for the neutralization of negative charges on the membrane surface, aggravating membrane fouling (Chen et al. 2015; Lin et al. 2015). 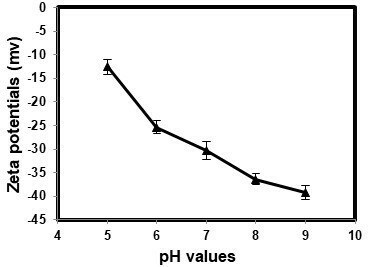 Low pH values tend to cause severe membrane fouling (Fig.5 (a)). High concentrations of H+ in the solution may weaken the electrostatic repulsion between the membrane surface and PAAS (Ang et al. 2006). At low pH values, mass PAAS particles attached to the membrane surface for weak electrostatic repulsion, reducing the membrane flux. The amount of PAAS particles adsorbed on the membrane surface decreased at high pH values, tending to mitigate membrane fouling. However, more binding sites were offered at high pH values for the complexation between PAAS and metal ions, increasing the metal ions bridging between PAAS in the solution and in the deposited layer, tending to aggravate membrane fouling (Nguyen et al. 2013). As an integrated effect, membrane fouling tended to be aggravated at low pH values. The filtration resistance distributions of membranes at different pH values are summarized in Table 1. The results indicate that weak electrostatic repulsion between PAAS and the membrane surface at low pH values resulted in higher Ra (adsorption resistance) and Rc (cake resistance). The PAAS particles may be quickly adsorbed on the membrane surface during the initial period of filtration. The cake layer formed at low pH values was more compact than that formed at higher pH values, aggravating membrane fouling. Figure 5 reports the results of the test related to sodium ion concentrations and also at different pH values. As shown in Fig. 5, higher rates of flux decrease were observed at lower pH and with higher NaCl concentration values. As can be seen from Fig. 5(b), PAAS solutions with low Na+ concentrations did not exhibit an obvious decline in relative flux during filtration. As the Na+ concentration increased, the decline of filtration flux became more marked. The relative flux at 30 min when filtering PAAS solutions with 0.1 M Na+ was 0.19, whereas the values for PAAS solution with 0.01 M Na+ was 0.68. In general, PAAS tended to be less charged at increased salt concentrations, which can be explained by the double layer compression effect. This phenomenon is similar to that reported by Wang et al. (2013) Thus, the repulsive forces between the PAAS and the membrane surface decreased at high Na+ concentrations. Mass organic matters adsorbed on the membrane surface, aggravating the membrane fouling. Fig. 5. Effect of pH values and Na+ concentration on membrane flux: (a) effect of pH values on membrane flux; (b) Effect of Na+ concentration on membrane flux. Concentration of PAAS is 200mg/L, other experimental conditions: 10KDa membrane, =0.1MPa, ionic strength 5mM Fe3+. 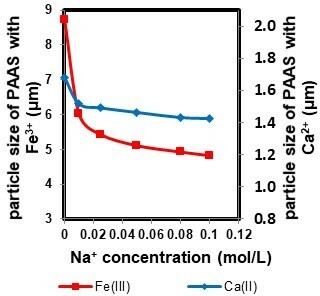 Figure 6 shows the particle size of PAAS with metal ions (Ca2+ or Fe3+) at different Na+ concentrations. The Na+ concentration had an obvious impact on the particle size of PAAS. As can be seen in Fig. 6, the particle size of PAAS decreased with increasing Na+ concentration. The observed results demonstrate that the particle size of PAAS with 5 mM Fe3+ and 0.1 M Na+ was 4.83 μm, smaller than that of PAAS with 5 mM Fe3+ and 0.01 M Na+ (6.02 μm). This indicates that the concentration of Na+ had a negative effect on the aggregation of PAAS molecules. High Na+ concentration in the solution competed with metal ions for the active sites of PAAS, reducing the complexation efficiency between the PAAS and metal ions (Zhang et al. 2015). To study the influence of metal ions on membrane fouling, a series of filtration experiments using model PAAS solutions with various concentrations of metal ions were carried out. The pH values of PAAS solutions were adjusted to 7, and the Na+ concentration was 0.1 M. The particle size of PAAS in different PAAS-metal ion systems is provided in Fig. 6. The evolution of the ultrafiltration membrane relative flux (J/J0) is shown in Figs. 7 and 8. As can be seen in Fig. 6, the particle size of PAAS was clearly influenced by the concentration of metal ions (Ca2+ and Fe3+). A smaller particle size was seen in the membrane-PAAS system without metal ions. There were repulsive forces between PAAS molecules due to the negative charges of PAAS in water, which resulted in good dispersion of PAAS (Hao et al. 2013). The size of organic matter increased with the addition of metal ions. PAAS matter contains carboxylic groups, which bind with metal ions to form large particulates. As shown in Figs. 7 and 8, the addition of metal ions seemed to increase PES membrane fouling. The reasons are as follows: firstly, the complexation between PAAS and metal ions became more obvious at high ion concentrations, increasing the metal ions bridging between PAAS in the solution and in the deposited layer. Large organic particles were fixed on the membrane surface. The cake layer that formed in this case was thick and compact, aggravating membrane fouling. Secondly, the addition of metal ions may neutralize the negative charges on the membrane surface, reducing the electrostatic repulsion between the membrane surface and organic matters, and larger particle foulants may easily attach onto the membrane surface, causing membrane fouling during the early stage of filtration (Habib et al. 2013; Zhang et al. 2013). 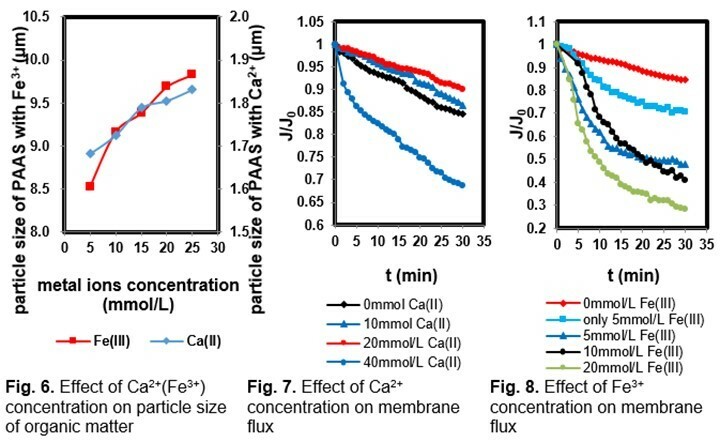 The membrane flux decline caused by model PAAS solutions with various concentrations of metal ions was further studied through fouling resistances. The filtration resistance distributions of membranes at different Na+ concentrations are summarized in Table 2. The results indicate that weak electrostatic repulsion between PAAS and the membrane surface at high Na+ concentrations resulted in higher Ra and Rc. Mass PAAS particles adsorbed on the membrane surface during the initial period of filtration. The cake layers that formed at high Na+ concentrations were more compact, aggravating membrane fouling. As shown in Fig. 9, at different ion concentrations, a close relationship was found between the membrane fouling and the filtration resistances. For the PAAS solution with 40 mM Fe3+, the membrane resistance of Rm comprised a small proportion of the overall resistance (18.17%), but a much higher resistance of cake layer formation was observed (38.94%). High concentrations of metal ions yielded a larger particle size of PAAS and filter cake pollution, which contributes to lower pore-blocking resistance and larger cake resistance. In this case, the membrane flux declined rapidly. In contrast, the model PAAS without metal ions yielded lower cake resistance and less membrane fouling. 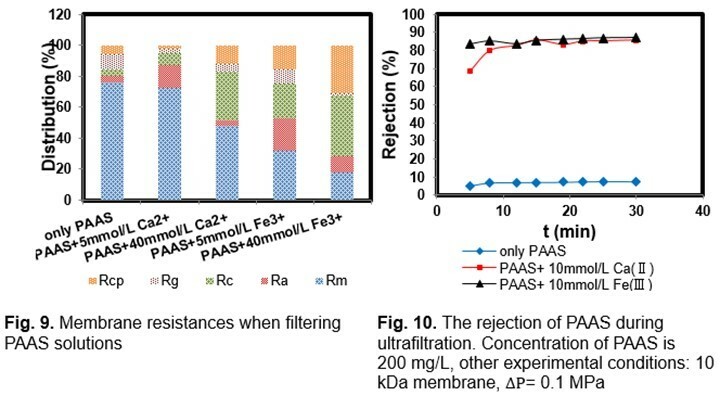 The PAAS rejection (R) during filtration was studied relative to the fouling mechanism of PAAS at different metal ion concentrations (Fig. 10). The low rejection (~10%) of PAAS showed that the intrinsic pore size of the membrane was large enough to allow most PAAS molecules to pass through. The addition of metal ions (Ca2+, Fe3+) to the feed PAAS solution clearly increased the PAAS rejection. The high rejection of PAAS (~85%) might have been caused by the formation of larger aggregates of PAAS molecules via the creation of Ca2+ (Fe3+) bridges the PAAS molecules, and by Ca2+ (Fe3+) bridges between the PAAS in solution. Ca2+ (Fe3+) might also have formed bridges between the PES membrane and the PAAS molecules. SEM imaging (Fig. 11(a–d) was used to observe the membrane surfaces fouled with PAAS at different metal ion concentrations. The virgin PES membrane exhibited a smooth surface (Fig. 11(a). After filtration of the PAAS solution without metal ions, a small amount of foulants appeared on the membrane surface (Fig. 11(b)). Interestingly, large amounts of foulants were observed on the membrane surface after the filtration of PAAS with metal ions. For the filtration of PAAS with higher metal ion concentrations, the whole membrane surface was covered by foulants. The cake layer seemed to be more compact and thicker than in other cases. An EDS analysis was performed to determine the elements present on the fouled membrane surfaces. The analysis revealed the presence of Fe on the membrane surface (Fig. 11(e–f)). Compared with the content of Fe on the membrane surface fouled by the 5 mM FeCl3 solutions, the content of Fe was lower on the membrane surface fouled by the PAAS/Fe solutions. This may imply that PAAS molecules surrounded the Fe in the solution, then the PAAS/iron complexes were deposited on the surface of membrane (Hao et al. 2013). To better understand the fouling mechanism of the membrane filtering PAAS solutions with various metal ion concentrations, the membrane flux curves were fitted using Hermia’s semi-empirical model. According to the Hermia model, four possible fouling mechanisms need to be considered: complete blocking; intermediate blocking; standard blocking; and gel layer formation (Abdelrasoul et al. 2013; Aslam et al. 2015). The fouling mechanism can be assessed using Hermia’s model under the condition of dead-end filtration (Su et al. 2015). The fitted situations (R2) of the models found by studying the effect of metal ions concentration are shown in Table 3. Intermediate blocking was well-fitted to the experimental results for the PAAS solution without metal ions. In this case, the particle size of PAAS was observed to be low. The membrane pore size was large enough to allow PAAS molecules to enter membrane pores and precipitate onto the pore, causing pore blockage. On the other hand, the highest value of R2 was obtained for gel layer formation models when the PAAS solution contained a high ion concentration. With increasing concentrations of metal ions, the average particle size of PAAS molecules increased due to the complexation between PAAS and metal ions. Most of the molecules were larger than the membrane pores. The gel-cake formation played a significant role during filtration. Meanwhile, the addition of metal ions may neutralize the negative charge of organic matters, reducing the electrostatic repulsion between PAAS and the membrane surface. Large amounts of complexes were adsorbed on the membrane surface, resulting in severe membrane fouling during the early stage of filtration. Hence, gel layer formation was the dominant mechanism for PAAS solution with high ion concentrations, and intermediate blocking fouling was the major mechanism for the PAAS solution without metal ions. where t is the filtration time (s), and V is the filtrate volume (mL). By plotting the data as V against t/V, can be obtained from the slope of the linear relationship. To ensure that the linear regression results in R2 values larger than 0.9, only the straight portion of the plot was included in the regression (Sioutopoulos et al. 2010). called “fouling index” is considered a measure of the water fouling potential. Figure 13 shows the values for the fouling index according to various ion concentrations. The values of increased as the ion concentration increased. This conclusion corresponds to the results that the addition of metal ions causes severe fouling. Figure 12 shows a sketch of membrane fouling at various ion concentrations. The complexation between PAAS and metal ions became obvious with the addition of metal ions, leading to larger organic aggregates rapidly adsorbing on the membrane surface (Khan et al. 2009; Jin et al. 2015). These results can be attributed to three reasons: firstly, the metal ions may bind with –COOH in the PAAS molecules and bridge PAAS molecules to form a cross-linked chelate cake layer, aggravating membrane fouling (Lin et al. 2001). Secondly, the addition of metal ions may neutralize the negative charge of organic matters, reducing the electrostatic repulsion between PAAS and the membrane surface. Mass PAAS matter became attached on the membrane surface during the early stage of filtration. Thirdly, increasing metal ion concentration and salting out may reduce the solubility of PAAS, increasing the hydrophobic effect of organic matter (Al-Degs et al. 2008). In this case, there is obvious attractive interaction between PAAS and the membrane surface, aggravating membrane fouling. Hence, cake layer formed at high ion concentrations and tended to be dense. This result suggests that the concentration of metal ions played a significant role in cake formation. The membrane fouling was aggravated with increasing metal ion concentration. This paper put forward the mechanisms regarding the influence of dissolved organics in papermaking whitewater together with metal ions on the ultrafiltration (UF) membrane fouling and provided theoretical support to interactions between various metal ions and DOM in papermaking whitewater. Increased pH values influenced the interaction between metal ions and dissolved organics, resulting in a slow membrane flux decline. The increase of Na+ concentration reduced the particle size of organics and increased the membrane fouling to some extent. Increasing concentrations of metal ions resulted in greater membrane fouling due to their chelation with dissolved organics. For water samples with a high concentration of metal ions, gel layer formation played a major role in membrane fouling, whereas for solutions without metal ions, intermediate blocking formation was the major fouling mechanism. The concentration of metal ions played a significant role in cake formation. Membrane fouling was aggravated with increasing metal ion concentrations for the higher values of the specific resistance of cake. Heidari, A., Younesi, H., Mehraban, Z., and Heikkinen, H. (2013). “Selective adsorption of Pb(II), Cd(II), and Ni(II) ions from aqueous solution using chitosan-MAA nanoparticles,” International Journal of Biological Macromolecules 61, 251-263. DOI 10.1016/j.ijbiomac.2013.06.032. Su, W. P., Chen, C., Zhu, Y. L., Yang, W. S., and Dai, H. Q. (2015). “Fouling characteristics of dissolved organic matter in papermaking process water on polyethersulfone ultrafiltration membranes,” BioResources 10(3), 5906-5919. DOI: 10.15376/biores.10.3.5906-5919. Article submitted: August 30, 2015; Peer review completed: October 16, 2015; Revised version received: November 17, 2015; Accepted: November 20, 2015; Published: December 9, 2015.